Negeri Sembilan is a state located south-west of Selangor, south-east of Pahang and north of Malacca / Melaka. Its latitute coordinate is about 2o45'N and longitude coordinate is about 102o15'E. Negeri Sembilan has population of about 997,000 with 55% Malays, 24% chinese and 15% indians. Majority of its people can speak Bahasa Malaysia / Melayu and some English. Negeri Sembilan has a land area of 6,686 km2. The Main Range (Titiwangsa Range) passes through the north-east side of Negeri Sembilan. As the Titiwangsa Range ends near Negeri Sembilan and Johor, this state has very few popular nature places to go. The flora and smaller animals in the jungle are the same as other states because the weather of all the states in Malaysia are the same, tropical rainforest with equatorial climate. Negeri Sembilan has one forest reserve called the Kenaboi Forest Reserve in Jelebu district. Adventure seeker can come to Kenaboi Forest Reserve as it has the highest peak in Negeri Sembilan called Gunung Antu Besar at 1462 m above sea level. Kenaboi Forest Reserve has a waterfall called Lata Kijang and Jeram Berungut canyon which can be reached using a 4-wheel drive. The culture of the Malay people of Negeri Sembilan is different from those of other states. The Negeri Sembilan people practise the Perpatih custom which is different in its marriage customs, property ownership, dances and dressing (especially the ladies headdress). The capital of Negeri Sembilan is Seremban. Seremban's main bus terminal is called Terminal One. 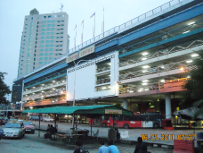 This bus terminal has express buses from all over Peninsular Malaysia and also local buses. A taxi station is located just in front of this Terminal One bus station. Behind this bus station is a shopping mall with shoplots and Parkson store as one of its main tenant. Seremban Railway Station can be reached from this bus station using an underground walkway near the taxi stand. It is about 5 - 10 minutes walk from this bus station. The Keretapi Tanah Melayu or KTM, Malaysia's railway operator, has two railway tracks passing through Negeri Sembilan. The track from west coast comes from the north-west through Batang Benar station and split into two tracks at Seremban railway station. One goes south-west to Port Dickson. Another goes south-east near Malacca border at Kg Ulu Kendong going towards Gemas Railway Station near Johore border. The track from east-coast enters Negeri Sembilan from the north-east through Air Hitam station in Jempol district to Gemas Railway Station in Tampin district. Gemas Railway Station is the meeting point of the west coast railway track and the east coast railway track. The only place that I have been to in Negeri Sembilan is the old Sri Menanti Palace, now known as the Royal Museum of Sri Menanti. Oh yes, and just a small area in Seremban near Terminal One. 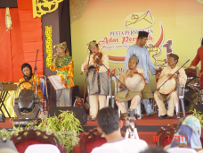 Historical places are Adat Museum in Rembau district, Lukut Museum in Port Dickson district, House of Pendita Za'ba in Jempol district, Pengkalan Kempas Historical Complex in PortDickson district and Sri Menanti Royal Museum in Sri Menanti. Nature lovers and eco-tourist can get away to De Bana Recreational Forest (for abseiling), Ulu Serting Recreational Forest (suspension bridge), Ulu Bendul Recreational Forest and Kenaboi Forest Reserve.